Cornell Tech, a graduate school at Cornell University focused on technology, business and entrepreneurship, has inaugurated the Tata Innovation Center, a facility formerly known as The Bridge that "brings academia and industry together under one roof to share ideas and research on next-generation digital technologies and how to commercialize new areas of collaboration." The new center is named for Tata Consultancy Services (TCS), a global IT services firm that contributed $50 million to help the school invest in technology research as well as expand K–12 digital literacy programs in New York City. The goal is to establish the Tata Innovation Center as a hub for New York's tech sector, support innovation at Cornell Tech and boost economic competitiveness in the region. 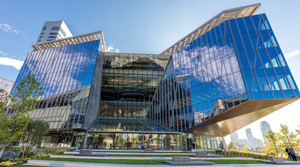 "The Tata Innovation Center will drive applied research and collaboration between Cornell, industry and the startup ecosystem in emerging areas including human machine interaction and cyber security, benefitting both U.S. business and local communities," explained Natarajan Chandrasekaran, chairman of the Tata Group, in a statement. The facility will house a mix of companies from diverse industries (including TCS), working alongside Cornell academic teams, according to a news announcement. Research areas will include human-computer interaction and cybersecurity. In addition, TCS and Cornell Tech will work together to "promote the integration of computational expertise" in the region's K–12 schools. "This multi-year community engagement effort aims to build digital fluency and computational acumen among students, educators and schools in the nation's largest public school system, with a special focus on girls, minorities and the underserved," the announcement said. "Cornell Tech stands apart because of our focus on academic excellence, coupled with real-world impact, and this new partnership with TCS will dramatically improve our ability to make a difference, from commercializing research to engaging with public school students across New York City," said Dan Huttenlocher, Jack and Rilla Neafsey Dean and vice provost of Cornell Tech, in a statement. "TCS shares our vision of ensuring all students and teachers have meaningful engagements with computer science in the classroom, and with their help we will reach even more schools."